Games By Design Has Moved! : A Valley Without Wind 2 - a full sequel free for existing customers - is coming. I've been hinting about this over here, and actually answered a lot of questions about it. However, we were planning on doing a big announcement through an interview with a major news site to announce the game, and so we didn't want to say too much. We're now reversing that stance, however. We actually don't particularly want major news coverage about this in advance of it being playable, we decided. Why? We don't want it to be over-hyped, and we don't want to run up against potential skepticism for people who didn't like the first game. We're still in the process of getting the art assets together to where we could really do a true announcement, and so we haven't even contacted any of the press just yet about it. Is this really a sequel? Make no mistake, Valley 2 is a true sequel -- it's a lot more different from the first game than many sequels are compared to their original. There are a lot of changes I've been wanting to make for a while to the game, but these changes were too deep to do without angering players who bought one game and then had us change it on them to that degree. This way players can keep playing the original in its current state (though we won't be doing much more of anything to update the original game from here on out), and they can also enjoy the awesome sequel for free as well. A Time Of Magic object in a finished-but-for-final-shading-and-texturing state. And I get this for free if I already have the first game? Yeah. Basically everyone will be getting both games whenever they buy either one. Kind of like what Zeboyd Games does with Breath of Death 7 and C Saves the World. You get both for the price of one. Why do it this way? Well, we think that's fairest to existing customers, for one. And for two, we don't think anyone will be much inclined to buy the first game after they see the second. But the first game is cool in its own right, and so that's something we wanted to preserve. It breaks a lot of new ground that no other games have ever experimented in before, and we didn't want to just throw that out. The game isn't perfect, and it doesn't last forever, but it's fun for a goodly number of hours and it's something that people should be able to experience for years to come if they're into that sort of thing. Meanwhile we get to move the "Valley franchise" forward in the manner of our choosing with the sequel. Cool "Pencil test" of a burly man walking animation. It's almost easier to define what is not different. But here are some of the highlights in no particular order. - Completely new enemies. At the moment, 120 have been designed and are scheduled for art and programming, but not all will be available right at first beta. They have a lot more variety of designs both artistically and in terms of gameplay, and they are in general a lot smaller and thus something you can get more up close and personal with. In general the feel is closer to a Metroid game or similar in terms of the scale of enemies (whereas previously in AVWW1 the enemies were 4x to 8x larger than in Metroid in many cases). - Completely new procedural generation methods. We'll be using a "slices" methodology to create undergrounds, interiors, and exteriors. This basically uses pieces of chunks that are created by hand in a level editor and then assembled and populated randomly. Although enemy placement will be done by the 11 broad classes of enemy, and thus will be hand-done. That way you'll get much more interesting and unique scenarios with enemies compared to what you did in the first game. -Huuuuge new citybuilding game that ties everything together. This is much more descended from Actraiser now. Keith and I spent four days on skype designing out the new game, and this was one of the biggest topics. The new citybuilding game uses dozens of buildings on the map that you capture, and some of which you can convert into other building types. You can give your survivors orders, and they gain skills in five skill categories based on what missions you send them on. 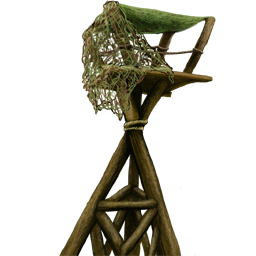 - The dispatch model for NPCs is completely different and much improved now; no more moods, profession books, or gifts. No more professions at all, in fact. These were grindy and annoying, and we have a much better model that involves multi-NPC dispatches and skill points in five categories that improve based on successful missions. Plus the risk of death on missions will be a lot lower than in the first game, meaning you're not feeling so heartless sending these poor folks out. There's more strategy and less cannon fodder. Incomplete view of one generated world map in an external diagnostic tool. -Entirely turn-based in the macro-game. The citybuilding stuff is all turn-based, and even the day/night cycle is now turn-based. It flips back and forth between day and night as you change turns. There are thematic reasons for this, and it lets us have a unified timescale rather than a separate day/night cycle and time period cycle. -It is actually possible to win the game. Each game is more randomized in how it unfolds, and basically plays out across what would be a super-continent in the old game. Much larger than a single continent, but not infinitely large. In fact, the entire world is generated right when you start it (as with a galaxy in AI War) and that becomes the basis of how you plan out your advances and strategy of how you're going to become more powerful. When you actually defeat the overlord, you win the game. If you play it again, the game will play out quite differently. -Since these are now more finite campaign-style engagements more like we have with AI War, this also means that you won't be able to change the difficulty once you start the game. This makes each campaign a finite experience that you play, win or lose, and then play again if you like. You can even set the size of the world that you want from a dropdown, and that will also affect how many levels you get from each level-up tower that you conquer on the map. -You are not a glyphbearer. You're actually a former henchman-in-training of the overlord; so kind of a bad person turned good. You've got an Oblivion Crystal which serves a different function from the glyph but occupies the same space. -No more permadeath. The oblivion crystals prevent you from dying, and instead bring you back from the dead anytime you die. Your survivors can (and will) still die permanently, however. The overlord and his other henchmen also have oblivion crystals, however, so they are literally invincibile also. They can be killed same as you, but they'll come back to life and return to fight another day if you defeat them. You'll face the henchmen several times and defeat them several times on your quest to beat the overlord, but if you see the overlord before the end of the game (which will happen from time to time) you had better run instead of trying to fight him. A Bronze Age object in a finished-but-for-final-shading-and-texturing state. -Ilari are nowhere to be found. All those guardian stones, and indeed the glyphbearers in general? It's not just that you aren't a glyphbearer -- they don't exist in this part of Environ. Similarly, the wind never reached the level where it drives people crazy here. Wind is still a big problem all over the world map, and prevents your movement -- you'll have to "purify" tiles in order to be able to advance further on the world map because of the wind. But in general, this means that there are pockets of people all over the place, rather than people coming together for big settlements huddling around the Ilari. Environ is a big world, so this is just a part of it that is neglected by the Ilari and thus has woes of its own. -No more settlements, and survivors don't need to be rescued. It's been a year since the events of the first game, and people are pretty used to what has happened by now. Your problem isn't to rescue the survivors, it's to recruit them. For that you'll use other survivors who will be dispatched to convince them to join your uprising against your former master. -The overlord and his henchmen actively terrorize the countryside. You'll see their tokens moving around and literally destroying buildings of yours every few turns on the macrogame side. Your survivors don't stand a chance against them in combat, so the only thing you can do is to try and create "reverse traveling salesman" problems for the overlord and his minions, while also rebuilding as you go. -You're not just fighting Generic Overlord #5 and his lieutenants. The sole overlord you'll be facing in this game (for now) is named Demonaica and has a specific look, backstory, and all that good stuff. His henchmen (which differ from lieutenants in many important ways) are named Slender, Lilith, Vorgga, Fanzara, and Wordrak. 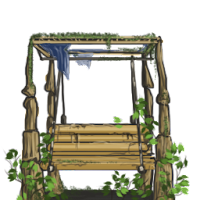 A Wild Garden Age throne in a finished-but-for-final-shading-and-texturing state. -Speaking of which, since there is no longer permadeath you won't be playing a long line of characters you barely care about. When you start a new game, you'll create your character and then that will be your character for the rest of that campaign. The basic character creation process is much like in the first game, except that you get to choose from any time period right from the start rather than having to unlock them. Then as you go through the game, there are a ton of new character customization options that you'll run into (see below for more info). -There is an all-new roster of 24 unique characters. There are four each -- two male and two female -- from six time periods. You cannot play as Draconites (who are not in this game, though tons more dinosaurs are in general), nor can you play as Neutral Skelebots (also not in this game, though several new enemy skelebot types are), nor can you play as ice age characters (which were over-represented in the first game, so I wanted to do something different). Some new character portraits at a finished-but-for-final-shading-and-texturing state. -No more inventory, or loose items, or crafting (please don't freak out, you'll see why in a minute). This means no more stash rooms, and no more item pickups, and no more opal guardian store or consciousness shards. No more spellgems, no more spell scrolls, no more grinding to find stuff in various random parts of the world. No more materials, or placing wooden platforms or crates, or using settlement stockpiles (no settlements, recall?). I'm sure some of your are thinking "WTF" about this particular line item, so let me explain the subsystem we have in place of all that -- it's much more streamlined and lets you get to the meat of this game much better. -First off, there is now a class system that lets you choose what kind of mage you're going to be. There are five overall tiers of mage classes, and you'll unlock each of them as you play through the game. The first tier you start out with, and you can choose from among 5 randomized mage classes to play as. Overall there are 10 mage classes per tier, and so each playthrough is a bit different as you have different options each time. Each player in multiplayer also has their own randomized set of classes, too. First 25 mage class icons in a final state (plus 2 sketches). -So what is a mage class? Essentially it defines your basic abilities. The way the game controls is now completely different, and a lot more like a classic Metroidvania title rather than taking inspiration from MMOs. This way always our goal with the first title, but somewhere along the lines we strayed. You'll always have four abilities at your fingertips, which are entirely set by which mage class you choose. Each mage class has a primary, a secondary, a special, and an ammo-based attack. This lets us hand-tune the combinations of spells to make many interesting sets that you'll switch between on occasion depending on what kind of area you're about to embark into. -The controls are also streamlined. That whole mouse+keyboard thing was really a bad idea, as some players pointed out to us. That sort of freedom of aiming really kills the classic Metroidvania style of a game like this, and makes it so that keyboard-only players and gamepad-only players are at a huge disadvantage. So we're moving down to two streamline control schemes that are equivalent with one another: keyboard-based and gamepad-based. And yes, the tab-targeting is gone since that basically acts like a cheat at this point without free-aiming of the mouse. Please note! We're not just taking away control options for kicks, or because we think people were "doing it wrong." But the fact remains that generally a game is built around its controls, especially as an action game. We're trying to maintain as much flexibility in the controls as we can while not making it so that people are playing fundamentally different games that we can't make universally fun. Placing wooden platforms was trivial with the mouse, and so is killing a bat. But it's incredibly frustrating with any other sort of input. When you get right down to it, what we're trying to make is a Metroidvania game, and I don't personally know of any of them that use a mouse-style of control. Hence we're going a bit more standardized with that, and I have to say the controls feel really good. Lighthouse building in a final state. - But back to the whole customization thing. Rather than customizing yourself with what you craft or what you happen to randomly find from missions or in a cavern, now you customize yourself with perks and feats. -Perks: Each time the world level goes up, everybody gets a list of new perks that they can apply to themselves. You can choose only one per level to apply to yourself, but you can reconfigure your choices later if you change your mind (not in the field; when you return to certain safe places). There are 20 possible levels to attain, and 5 perks per level. However, only a randomized 2 perks will be available to all players right at the start of achieving any particular level. By exploration, players can find tokens that will unlock the other three perks on each level and thus let them further customize themselves. Perks are basically things like improved health or speed, better jump height, etc. They are largely replacing the enchants model from the first game (enchants are also gone). -Feats: feats are actually active abilities that you can trigger on yourself, like double jump, miniaturize, etc. You start out without any of these, but you can acquire them by busting into skelebot research facilities and hacking their mainframes. -The last way that you can customize yourself is by the choices made on the world map, in the macro-game. These are choices that affect all players, and/or survivors. 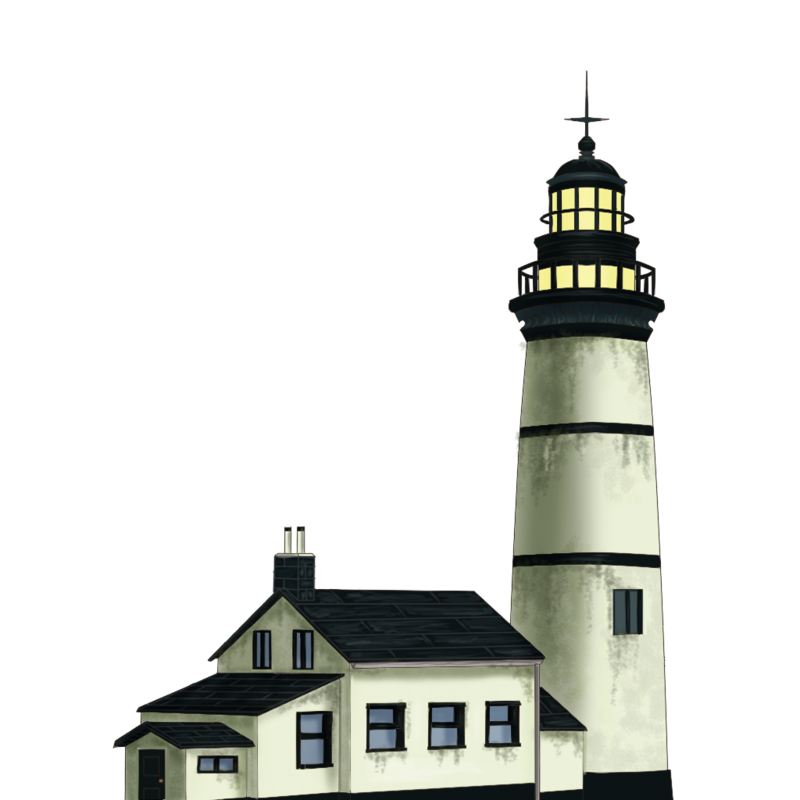 By capturing certain buildings, for instance, you can increase the distance you can see in dark places. By capturing others, you can make it so that you are able to go into excessively hot or cold areas (the heatsuits and snowsuits are replaced by this mechanic that is integrated into the strategy/citybuilding side of the game). -In general, this game is really a mix of straight-up Metroidvania style shooting and dodging with the longer-term thinking and planning on the world map. With customization and character loadout choices thrown in -- made more interesting by the fact that you can't just line up all the "best" spells, but instead have to choose which full loadouts will best fit the current circumstances. So there's quite a few more interesting choices to make now, without there being so many individual choices to make except in the macro-game. A Wild Garden Age statue in a finished-but-for-final-shading-and-texturing state. -Physics! The physics of the game are also going to be tuned quite a bit. That's something we haven't implemented yet, but we're experimenting around with various ideas for it and think we know of a number of ways to make that feel smoother and nicer. Simply having it so that the terrain is actually built for you rather than just being procedural all over the place is going to make a big difference, of course. -Bosses! There's going to be a lot less emphasis on bosses in general in this game, because they were too frequent in the previous game. However, the encounters with regular enemies will be a lot more interesting because of that. With bosses we're going to be moving to multi-stage behaviors where they shift behaviors mid-fight. We'll also be having smaller, saner boss rooms that really give a better Metroidvania vibe. -Spells! Some of the old spells, like shields and seize and so forth, are being removed -- they either weren't useful enough (seize) or they were unbalancingly useful (shields). We'll also be revising most spells in general, adjusting their characteristics and size and move speeds and all that. These go along with the physics changes in general, and bosses will get the same treatment. And then we're also going to be adding just tons and tons of new spells and spell visuals for all the mage classes. a number of them will essentially be visual upgrades from one spell to another, but that's something players have asked for for a while; essentially there won't be any invisible "this spell is stronger but looks the same" modifiers or levels. The stronger ones will look it! Spells also will have a vastly lower cooldown across the board, meaning that you can get a much more satisfyingly fast-and-furious effect with them. -Ammo! A single spell out of the four you get from each class will be ammo-based. Enemies will drop either health or ammo when you kill them, and each ammo pickup is only part of what is needed to cast the ammo-based spell once. So these ammo-based spells are really something that you'll want to use sparingly, but since there is a pretty low cap on how much ammo you can hoard, you're still encouraged to use them periodically. Like in a Metroid game rather than in something like Final Fantasy where I hardly ever use a consumable weapon. And not all the ammo spells are weapons -- one of the animal-related mage classes has an ammo ability to turn into a bat (as in the first game), and that effect lasts until you take a hit. -Health! In general, after playing a lot of Cave Story and Super Metroid and similar games lately, we've realized that in AVWW1 players really have too much health. And so do many of the monsters. All in all it was trying to be a bit RPG-like and thus turning into a bit of a slug-fest. That's something we're rebalancing entirely to be more in keeping with the other Metroidvania titles, and even games like Zelda. That's one of several things that should lead to a much more satisfying experience in our opinion. An evergreen forest object in a finished-but-for-final-shading-and-texturing state. -I've mentioned that missions are gone, but I've not mentioned what is replacing those. That's a bit hard to answer in a specific fashion. I suppose the best answer would be "the game." In other words, AVWW1 was kind of an undirected sandbox in most areas, but in some areas you could take on these instance-based missions and have a somewhat more directed time with them. In Valley 2, the entire flow and point of everything is different. All of your adventuring is directly in service of your larger strategic/citybuilding goals, and your strategic/citybuilding goals feed right back into making you more powerful so that you can take down the overlord. It's a much more tightly integrated loop there, AND the actual gameplay locations for the game in general are more unique and interesting, so the need for missions themselves really vanishes. Which is a good thing in my opinion, as they felt a bit artificial in execution anyhow. I really prefer how everything is so concrete here and is so tied together into your overall goals of both halves of the game. -Call in the Mercenaries! Some parts of the game will intentionally have uneven difficulty, however. These particularly challenging areas are often caused by enemy buildings that project onto the world map tiles nearest to them (and some other enemy buildings block travel on the world map until you send your survivors to destroy them, incidentally). Sometimes you'll need a bit of an extra push to make it through an area like this. Well, another thing that you can collect out in the world are mercenary coins which you can then use to call the mercenaries in on a hotline. When you do so, they'll travel with you like a familiar (or like one of those NPCs from the first game that floats after you during a rescue). They'll stay with you until the next level-up or until they die, and the added firepower can be a real boon. It's also another decision point on how you best use your resources, which is critical on higher difficulties. A Wild Garden Age object in a finished-but-for-final-shading-and-texturing state. - If you're interested, the citybuilding/strategic model has five main resources: Food, Scrap, Mana, Morale, and Housing. Each one of those works differently from the other, and each one can only be impacted by your actions in the strategic mode; so in other words, you can't play a poor strategic game but then grind on the adventure side to make up for it. We've put in a lot of work to make sure that while the two modes do have tight integration between one another, you can't just grind in one mode to win at the other. You have to actually play well (for the difficulty level you've chosen) at each half of the game to win. And you'll be flipping back and forth between modes pretty regularly, to keep either side from getting stale; each enriches the other. -Oh, and yes: you can also lose the game, as well as being able to win it, now. 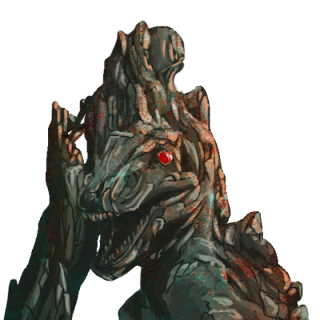 Despite the fact that you are un-killable thanks to your oblivion crystal, if all your survivors die then you lose. -And also: there's all new objects for the game in terms of the art, too. As you've seen throughout this post, Heavy Cat is working on all-new time-period-appropriate art that is a lot cooler and more unique than what we had in AVWW1. - Also also: the platforming difficulty is going away, as are most of the things it affected. No more falling damage, no more rising lava, no more bouncing spike traps (regular spike traps remain, though, as do dangerfalls, blade traps, and mines). Also the freefall missions might be gone, but their concept is retained through some freefall segments you'll run into from time to time. 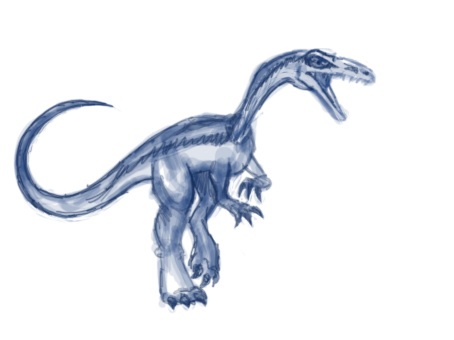 Monster at the sketch stage: Procompsognathus. And yes, one mage class can transform into these. So! If you've read all of this, then I imagine you found it quite a lot to parse. It was obviously aimed at people already very familiar with the first game, and so highlights all the differences -- of which there are quite a few. But why so many changes? Did we really have to change X or Y? Wasn't X or Y feature in the first game really fun, and thus shouldn't it have been included in the sequel? The first game was trying to be both a sandbox and a directed game, and that's just not very possible -- or at least not in a way we were happy with. The first game was always hugely successful at being a sandbox you could just run around in and have a good time at, but it was substantially less good at providing a forward-moving experience with tension and a satisfying game arc. That was something we repeatedly tried to address throughout the beta of the first game and after it's release. However, we met with only mixed success. At this point I'm convinced that we took those concepts as far as we were able to in the framework of the first game. Thus we really needed to get back to the roots of what we wanted to build in the first place before sandboxiness invaded the first game's design: a spiritual sequel to Actraiser with a much deeper citybuilding/strategic component, and with better platforming in a Metroidvania style. In order to do that, we needed to not have players faffing around with endless collection quests trying to find materials for crafting, or grinding for just the right spells, or doing all that manner of thing. Instead we needed to have some broad and important choices that players could make quickly to customize their character and then could later change at will if they changed their minds. That sort of thing keeps the action and the strategy game moving, but it means that we basically had to cut out this. But that was fun! That's why we still have the first game as a separate product that we bundle with the sequel (and vice-versa). That way you can play the more sandboxy game, or you can play the more directed, intense, interesting game. 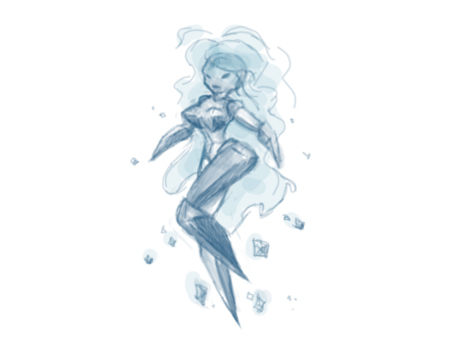 Monster at the sketch stage: Ice Esper. Both of these things have an enormous impact on balance. You could argue that these things are a matter of taste and customization, and I'd have to agree -- that's why they are in the first game, and why they remain there. But these were one of the biggest ongoing challenges to balance in the first game for me, and they are things that really put large segments of the player populace at a disadvantage if they don't use them. Here again, it comes to getting back to the roots of what we were trying to do. Yes, Terraria uses the mouse controls -- so do numerous other PC action-adventure games with a 2D sidescroller view. So do a lot of MMOs and RPGs. In the first game we were really enticed by the allure of all those things, and so we let our design drift and become unfocused. In other words, the design tried to become all things to all people, and Environ became a world that you could come and do whatever you wanted in. That's pretty fun! But it's very difficult to make a truly compelling game that way. What we needed to do with the sequel was really focus, and make the original game we set out to do. In terms of Mario Bros. games, what if Mario had a rocket launcher he could aim in any direction? What if he had a force field he could toggle on and off periodically at will? That might be entertaining for a bit, but that would fundamentally make a different game, I think. And I don't think a better game -- for Mario, all the enemies are designed around him not having abilities like that. So to give him those abilities means the levels would be crazy easy and hollow. On the flip side, the game Intrusion 2 uses mechanics like aim-anywhere firing, and it's a brilliant game. All the enemies are designed around the powers that your avatar has, and so everything fits together just right. But of course the character there doesn't have the movement abilities that Mario does -- if the character there had that kind of speed and jumping ability, then I suspect its mechanics would really start to break down -- in the same way Mario would if you gave the wrong weapons to him. A Wild Garden Age skeleton in a finished-but-for-final-shading-and-texturing state. What I'm saying is, games are additive in nature -- you can't just throw any old thing in there and expect it to be the same game. If you add a single new piece to Chess, you've dramatically changed that game. It doesn't matter what the piece even does. In the case of AVWW1, we had the movement speed of Mario 3 or so, and the aim-anywhere nature of Intrusion 2. We also had control schemes that did not support aim-anywhere, and that made it so that players were playing two different games. And that meant that enemies really couldn't be balanced around either, since in some cases could aim super-precisely and in others they could not aim remotely that well. What a mess. Again, I still think that really worked out pretty well in the main, but it's definitely a more niche experience and a bit rougher around the edges because of that. By focusing on specifically the kind of game we're actually trying to make, and not dragging in stuff from other unrelated genres if it doesn't really complement it well, we have something that's a lot tighter and more fun. It's not about taking options away from players it's about creating one game at a time rather than a whole soup of games. We still have a long way to go before we're ready to let people start playing the beta of this, but we should be ready for it in the November timeframe. We're really excited about how it's coming along, though! Here's the forum thread for this post if you want to join in the discussion about it. All I can say is SUPER KUDOS to you. I already own all your products and this is why, you are truly customer focused. I can't wait and also look forward to other upcoming titles and sequels from Arcen. Wow, the changes listed sound crazy. Can't wait to see how it plays. Okay, you are officially my favorite indie dev. Best of luck! Sounds amazing! You guys rule. Knew you guys would keep on trucking with AVWW until you were happy with it, but I don't think anyone expected anything *this* massive. Skipping straight to the sequel, with a more structured game design from the start? Kudos, Arcen. Above and beyond the call of duty - keep it up! The best of luck to you. If a videogame deserves to succeed, it's this one. I am super fricking excited! Even if you don't have the ability to aim anywhere you want, PLEASE have support for mouse buttons and scroll wheel. I hate it when games are keyboard only just because the developers were too lazy to add mouse button functionality. Thanks for the kind words and support, all! Support for the mouse buttons is being retained -- so if you wish to fire spells from the mouse buttons or by scrolling the mouse wheel, then absolutely you can still do that. The mouse cursor itself won't do anything during gameplay, but that's the only part of the mouse we're disabling. Cheers! Sounds pretty awesome. I bought a four-pack of this game back during the summer sale, but I've been waiting for something like this to send out the other copies I've got. I would like to make sure that the other copies from my four-pack will "upgrade" even if I haven't gifted them yet? Yep! No worries about any copies not upgrading; they all will. I feel like you guys could have held back on the release of the original and the only game could have been this one with a little more thought and development, but I have to say I really like what I see and like your sales strategy. Good work, I think this will be a success. Just mindless enthusiasm for whatever Arcen does next. I put you guys into my short-list of cutting-edge game developers. I also cannot wait for AVWW 2. What's with all the sprites for wild-garden age stuff if you're removing the ability to play as a dino-person. I was liking everything up until I read that... still sounds like a good game, but I am not as excited about it as when I first heard about it from my friend. These sound like some really well thought out changes. I can't wait to try the new game! The only thing that really upsets me is that RPG elements and inventories will be disappearing. I personally don't see how they couldn't be used in conjunction with the new tier system... And personally I find it intrinsically fun to find loot and build a character. Will there be a New Game+ mode or some equivalent? Or is all the replayability in starting from scratch after winning? -Regarding the loss of RPG elements and inventory, I think that will make sense better once you see it in action. That would definitely not work as well in the current design. -Regarding replayability, it is all in replay like AI War rather than new game+. The overall flow is much more like a strategy game now. Absolute class, am looking forward to it. Will the people who bought it on Steam get part 2 for free? Yes, it doesn't matter where you bought it, you'll get the second one free. Very exciting, love AI war, and looking forward to this! Bit surprised there's no mention of Super Mario Crossover. You don't have to speculate what Mario would be like with different abilities, you can go and play it right now, if you want. And yes, for one, the balance is thrown a good distance. sounds great! I was a little meh about Valley, but, uh, I guess I'm getting this second one for free, as an owner? can't complain! That thumbs.db looks like a badass character! Regarding replayability, it is all in replay like AI War rather than new game+. The overall flow is much more like a strategy game now.